When HBO introduced the first “SuperFly” Card there was no question who the biggest attraction was. It was former Pound For Pound #1 fighter in the world Roman “Chocolatito” Gonzalez who was looking to avenge his much disputed loss against Sor Rungvisai, a talented and mostly unknown fighter before his upset win over Gonzalez. The heavily favored Gonzalez was looking to prove the first fight was a fluke, and set himself up to fight the winner of Carlos Cuadras vs Juan Estrada.. two fighters he had previously defeated. That did not happen. Instead the larger Rungvisai connected with a clean shot and followed it up with another en route to a highlight reel knockout victory. On Saturday HBO and Tom Loeffly gave us “SuperFly 2” that did not include Chocolatito. Instead it was Sor Rungvisai defending his strap against Estrada. 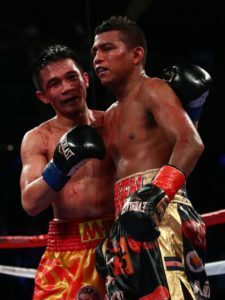 The matchup more then delivered…Rungvisai landed big shots, and Estrada kept coming forward and scoring with combinations and only got stronger as the fight went on. After the final bell rang Rungvisai had proven that he was not a One-Hit wonder. He is a legitimate pound for pound talent, and even though Estrada lost the close decision, he also proved that he was a world class talent.